On the outskirts of our galaxy, a cosmic tug-of-war is unfolding-and only NASA's Hubble Space Telescope can see who's winning. Called the Leading Arm, this arching collection of gas connects the Magellanic Clouds to the Milky Way. Roughly half the size of our galaxy, this structure is thought to be about 1 or 2 billion years old. Its name comes from the fact that it's leading the motion of the Magellanic Clouds. The enormous concentration of gas is being devoured by the Milky Way and feeding new star birth in our galaxy. But which dwarf galaxy is doing the pulling, and whose gas is now being feasted upon? After years of debate, scientists now have the answer to this "whodunit" mystery. "There's been a question: Did the gas come from the Large Magellanic Cloud or the Small Magellanic Cloud? At first glance, it looks like it tracks back to the Large Magellanic Cloud," explained lead researcher Andrew Fox of the Space Telescope Science Institute in Baltimore, Maryland. "But we've approached that question differently, by asking: What is the Leading Arm made of? Does it have the composition of the Large Magellanic Cloud or the composition of the Small Magellanic Cloud?" Fox's research is a follow-up to his 2013 work, which focused on a trailing feature behind the Large and Small Magellanic Clouds. 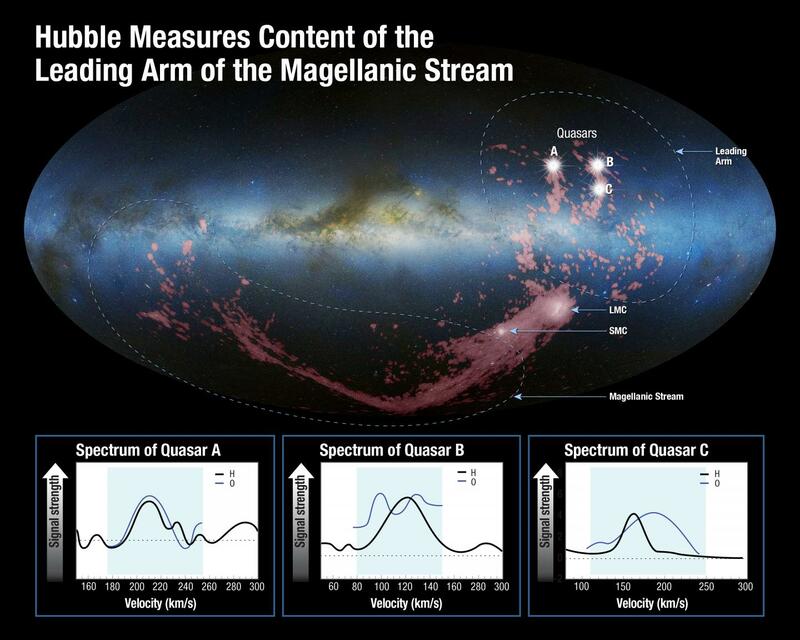 This gas in this ribbon-like structure, called the Magellanic Stream, was found to come from both dwarf galaxies. Now Fox wondered about its counterpart, the Leading Arm. Unlike the trailing Magellanic Stream, this tattered and shredded "arm" has already reached the Milky Way and survived its journey to the galactic disk. The Leading Arm is a real-time example of gas accretion, the process of gas falling onto galaxies. This is very difficult to see in galaxies outside the Milky Way, because they are too far away and too faint. "As these two galaxies are in our backyard, we essentially have a front-row seat to view the action," said collaborator Kat Barger at Texas Christian University. In a new kind of forensics, Fox and his team used Hubble's ultraviolet vision to chemically analyze the gas in the Leading Arm. They observed the light from seven quasars, the bright cores of active galaxies that reside billions of light-years beyond this gas cloud. Using Hubble's Cosmic Origins Spectrograph, the scientists measured how this light filters through the cloud. In particular, they looked for the absorption of ultraviolet light by oxygen and sulfur in the cloud. These are good gauges of how many heavier elements reside in the gas. The team then compared Hubble's measurements to hydrogen measurements made by the National Science Foundation's Robert C. Byrd Green Bank Telescope at the Green Bank Observatory in West Virginia, as well as several other radio telescopes. "With the combination of Hubble and Green Bank Telescope observations, we can measure the composition and velocity of the gas to determine which dwarf galaxy is the culprit," explained Barger. After much analysis, the team finally had conclusive chemical "fingerprints" to match the origin of the Leading Arm's gas. "We've found that the gas matches the Small Magellanic Cloud," said Fox. "That indicates the Large Magellanic Cloud is winning the tug-of-war, because it has pulled so much gas out of its smaller neighbor." This answer was possible only because of Hubble's unique ultraviolet capability. Because of the filtering effects of Earth's atmosphere, ultraviolet light cannot be studied from the ground. "Hubble is the only game in town," explained Fox. "All the lines of interest, including oxygen and sulfur, are in the ultraviolet. So if you work in the optical and infrared, you can't see them." Gas from the Leading Arm is now crossing the disk of our galaxy. As it crosses, it interacts with the Milky Way's own gas, becoming shredded and fragmented. This is an important case study of how gas gets into galaxies and fuels star birth. Astronomers use simulations and try to understand the inflow of gas in other galaxies. But here, the gas is being caught red-handed as it moves across the Milky Way's disk. Sometime in the future, planets and solar systems in our galaxy may be born out of material that used to be part of the Small Magellanic Cloud. As Fox and his team look ahead, they hope to map out the full size of the Leading Arm-something that is still unknown.